For Financial Protection, Insurance is necessary and the most neglected insurance is Personal Accident Insurance. One event which can wipe out your entire savings or a large part of it, is an Accident.......especially an Accident resulting in Disability and making the person unable to work as before. And yet, very few people take a PA cover for themselves. 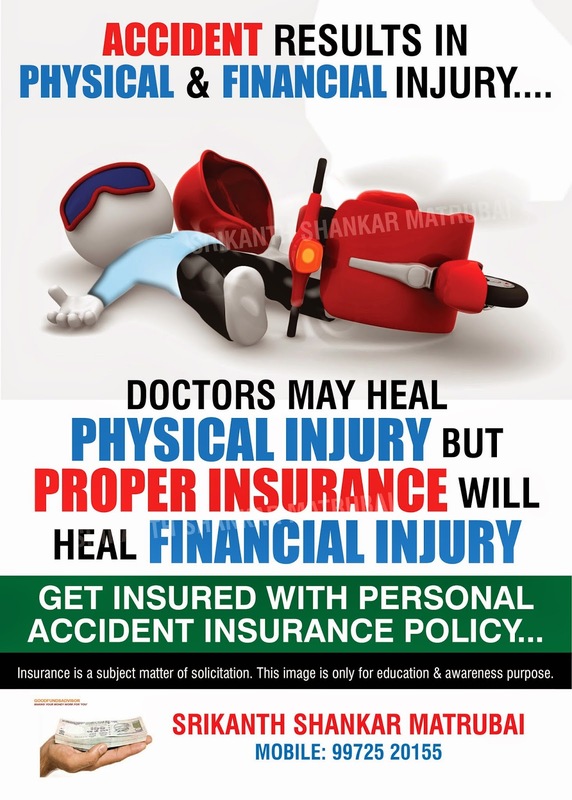 Not many know that this Personal Accident (PA) Insurance is very affordable, costing LESS THAN Rs.1000 for a family for a Cover of Rs.10 lakhs!!! !.............at least 10 times less than your Car Insurance. And the irony, people never fail to get their Car Insurance renewed but fail to even take a Personal Accident Insurance. You can get additional cover like Hospital Cash, Temporary Total Disability cover by paying a marginal extra premium. Normally, a layman persumes that since his Motor Cover has got a PA insurance built in, he doesnt need it. But these policies cover only Death and Permanent Accident ignoring Temporary Disability. In fact, most policies cover even Loss of Livelihood. The premium for a Personal Accident is not based on your age and hence a middle aged person of say 42 years will also pay the same premium as a young 25 year old. The Premium is based on the nature of your work. So, if you are working as a Salesman, then your premium can be very high. Just as a Term Insurance is a compulsory insurance cover you should have, I recommend that you should have a Personal Accident Insurance cover. By the way, let me clarify, if an accident occurs while you are under the influence of Alcohol, you will not be covered! Just clarifying!!! !